Well I finally did it, I have been baking for all these years and finally made a starter. I decided to use the one from Breads from La Brea Bakey I just started it 3/11 and thought I might chronicle my adventures here in case anyone cares and even if they don't it still will be fun. Day 1+2 was just like the book said "Pancake batter" I guess on day 2 I could see a few bubbles but I was getting a little worried. For those who read my first posts on the subject I did use non-organic black grapes that I scrubbed very very well to remove any residue I figured out the blueberries idea was just not feasable. Wow! what acceleration I woke up this morning and realized I have a living thing in my kitchen. The grapes had all but dissapeared in a cloud of bubbles the liquid on top has gradually moved to the bottom. I just looked at it before I came up to post this and I cannot see the grapes anymore at all. Well tomorrow will be my new pet's first feeding wish me luck all. Looks great, JIP. Up until I started feeding it on Day 10, I kept wondering if it was going to work. At times it smelled bad and looked bad, but then one day, the hooch smelled like red wine and I knew it was ok.
That's a nice big container. Well I am up to day 4 and this is the first feeding or actually this one is just "refreshing" as far as Nancy silverton is concerned after today it is just hurry up and wait till day 10 when feeding starts. One concern I have is about an hour after the final picture was taken all the liquid seemed to rise to the top and seperate I got some foam but not alot. I guess I should just watch and wait this is exactly what happened when I first made it so I am assuming this is normal?.?.? Yep, I wouldn't worry. I really should have taken pictures of my starter each day. Oh and Squid that is a 6qt. Oh and Squid that is a 6qt. cambro container. In Pittsburgh we are lucky enough to have a restaurant supply store that has a storefront that sell some of the commercial items to the public. I bought this for about $13 Nancy silverton suggests starting out with a 4qt and changing later over to a 6 so rather than buying 2 I just bought the 6 and will use it all the way through. Yeah, I figured that was a restaurant supply container. I saw something like it online but unfortunately couldn't find it here. Luckily I found some plastic stackable containers up to 8qt so I was able to change them out and clean them. The only time I needed the 6qt container was after the 3rd feed of the day. O.K. so it's day 6 and when I got up this morning and had breakfast I looked at my starter it is 2 days after refreshing and nothing. I'm getting a little concerned again I have seen pretty much no action since the refreshing just white on the bottom and yellow liquid on top a tiny bit of bubbles on top and a few bubbles suspended inside it smells good almost like wine but I'm not sure at this point if that is what it is supposed to smell like any comments? I understand your frustration. I've had starters that sit there slack, and others that practically splash you with bursting bubbles. 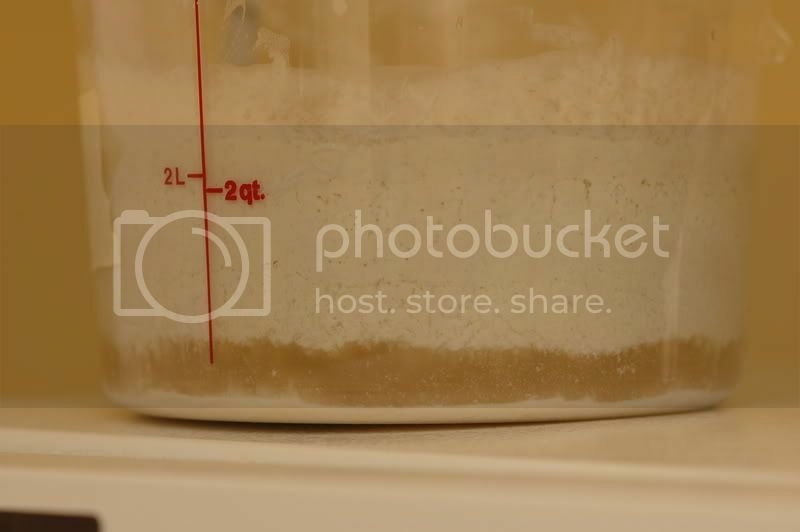 I've "washed" sourdough starters to rid them of too much bacteria. (Woods explains this in detail - actually works, but takes at least a week), and I've simply tossed out others that went "off." I guess I may never be one to keep a starter going for years, but it's fun to try. What's helped is giving myself permisison to toss stuff out when it doesn't work and start fresh. When I haven't got a mature starter, I go back to using yeast in combination with bigas and poolish. I'm still learning the mysteries of starters, and having more fun now. So true. I don't think I'm to that point even now. I still try to make pancakes from my extra starter, if my planned expansion goes wrong. I still have a hard time just tossing the old starter out, yet JIP is right that a little flour tossed out is no big deal. Meanwhile, while I was up in Montana skiing recently, I had to go back to poolish and biga. It was very nice to give that a go, actually. I find sourdough baking more satisfying in a number ways, most importantly I much prefer the flavors, but some good bread was baked with yeast and preferments. The other nice thing was that the rising and dough handling seemed easy after doing sourdough breads. Well I have no problem wasting a little flour it is pretty cheap and as far as the container it was really not that expensive either. If you really want to be helpful let me know where this bacteria came from and how to avoid it in the future. I am following Nancy Silverton's starter just because I like the recipes in her book. I actually plan on trying possibly the one in BBA and mabye others to see what works best for me this is just my first attempt but I really take no offense in constructive criticisim. What would really be helpful os a link or some instruction about the bacteria you say is in my starter after all this is a learning process for me. I have to admit not being much of a fan of the Silverton method or of very large quantities, but you have to start somewhere. You can work with tiny amounts without any problem, as long as you can measure them, but you can check all that out when you try other methods. The basic solution to the leuconostoc problem is to add some acid to the initial starter. Mac's suggestion to use pineapple juice instead of water in the early going of the starter would do that. I put ascorbic acid, 250mg/6oz of water in the first day starter to do about the same thing. At this point you may be more like where L_M was before she got her starter working. There is a good starter faq she used to get hers up and running. Links that might help to read would be: 1,2,3. So after I read the post about leuconostoc bacteria I did a search and one thing that came up was a site by Peter Reinhart and he suggested pineapple juice and just trying to stir the starter a little more like 2-3 times a day I think I will try and pursue this course and see where it gets me. 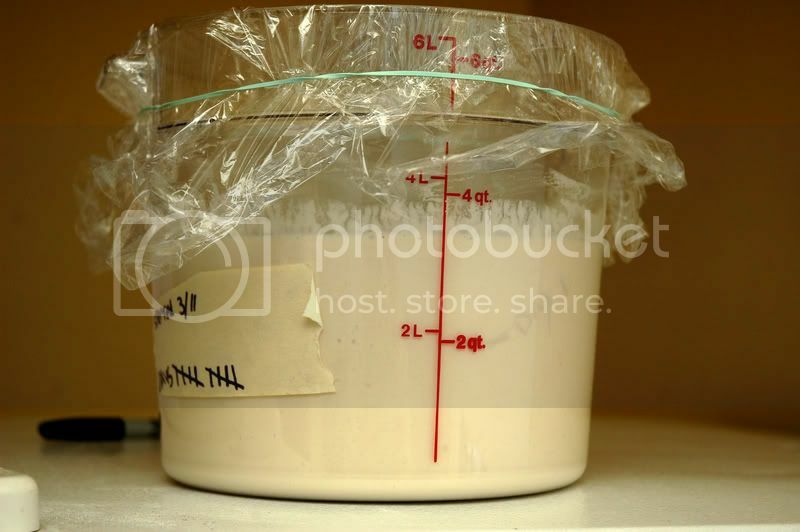 In the sourdough starter faq, there is a lot of discussion about getting a starter from brand new to the stable stage. L_M struggled for quite a while with it, and what finally worked was to use the "1 cup/12hr" method in that fact, for what it's worth. You could work that part of the experiment easily in small quantity on the side without disrupting anything else. If you have leuconostoc, you could also try the "1 tbsp/24 hr method", but substitute pineapple juice for the water or use 250mg ascorbic acid/6 oz of water. That would probably kill off the leuconostoc, if it isn't already dead. It dies off by itself pretty quickly, if that's what you have in there. The problem is, the whole culture goes dormant for days after it flares up that way in the first 24 hours. I don't think stirring is something that helps with the leuconostoc. It's just good to do every 12 hours or so to get some oxygen in the starter, which is supposed to encourage the yeast. It is also recommended in the faq I mentioned and lots of other starter recipes. Also, Squid's point is very well taken. In all the discussions I've read about leuconostoc or other early contaminations, even if they occur, eventually the right organisms assert themselves. It's just that it can take a couple of weeks. That is true, even if you don't add pineapple juice or whatever other acid because once there is some activity, the culture will generate its own acids to reject everything else. That's why it works, after all. I would encourage you to look at that starter faq, as it seems like the 1cup/12hr/85F method worked really well for L_M to bring sluggish new culture to life, if you get to a point where the culture is very quiet. Again, you can try it on the side, without disrupting the Silverton method, since you have plenty of culture to work with. I'll admit, I'd find it very interesting to know if it works, if you are inclined to try it. Nonetheless, Squid's point about patience may be the best advice of all. It seems to me that any of the methods always works eventually. JIP, as you know I don't presume to be an expert, but I still don't think it's a problem, based on my experience with Nancy's starter. You haven't got your starter on a regular feeding schedule yet, other than the refresh you did on Day 4. It's not until Day 10, when you start feeding it, that you'll notice activity. On the morning of Day 11, the difference was very obvious. I would try to be patient and wait until after you've put it on its 3 feeding/day schedule, before getting worried. If there's no activity by the morning of Day 11, be concerned. As per Reinhart's suggestion to keep stirring the starter, Nancy suggests the same after you start feeding it on Day 10. I actually stirred my starter a couple of times a day before Day 10. It just made me feel like I was doing something. With Nancy's starter, the hardest part is just waiting. - French levains tend to be milder than American sourdough starters (or the foreign starters I've bought online - and have since abandoned). - Like a sourdough culture, you can keep a levain going over time. - You can also create a very good levain over the course of a week every time you need it (and thereby never waste flour). - Firm starters tend to be tangier than looser ones. - Starters that ferment in cool conditions build up more acidic acid, and are therefore tangier. - Starters that ferment more quickly under warmer conditions tend to have much milder flavor while still lending flavor complexity and increasing bread shelf life. - Any of these starters can be used in combination with instant yeast, bigas, poolish or other preferments. And if you decide to tackle baker's math, you can convert these starters back and forth to make full use of what you've got on hand. I used a stiff levain as directed from Hamelman's book. Because my kitchen usually sits between 65 and 68 degrees, I adjusted fermentation times to allow for the chill. I also cranked up my oven a bit higher to about 510. You could have knocked me over with a feather when I pulled these out of the oven. I'll be using this same levain again for this weekend's baking. You should post your pics in the gallery..5 STARS!! I'd like to post photos in gallery but I'm having a little trouble doing so. I'm sure I'll eventually learn how to do it. I was having a problem also...I am lucky, my better half is a geek! The pics were too large..so he re-sized them for me..no problem after that. Course..finding a quality geek is difficult..LOL Your loaves are really nice!! I have been fortunate the last 2 weekends to have finally achieved some nice sourdough loaves, which we posted pics of. OMG Siliva - those loaves look amazing! Someday I hope that I can make breads like that! If they taste half as good as they look, they must be YUMMY! I am finding this tread very interesting as I have just baked my first successful sourdough loaf from my first sourdough starter last week. I started with the method in KAF's Whole Grain Baking book. I used their method for a whole grain starter for two weeks and then I left it in the fridge for a week and gave it a refresher day, then left it in te firdge for another week and gave it another refresher day. It smelled good but didn't have too much bubbly action going on. Then I decided to switch it to Peter Reinhart's method in BBA - so I switched to that and started using white high-gluten bread flour for three days after I took it out of the fridge. That seemed to create a lot of excitment in my little starter. Then i baked my first successful sourdough loaf - of which I want to post a photo as soon as i get a chance! 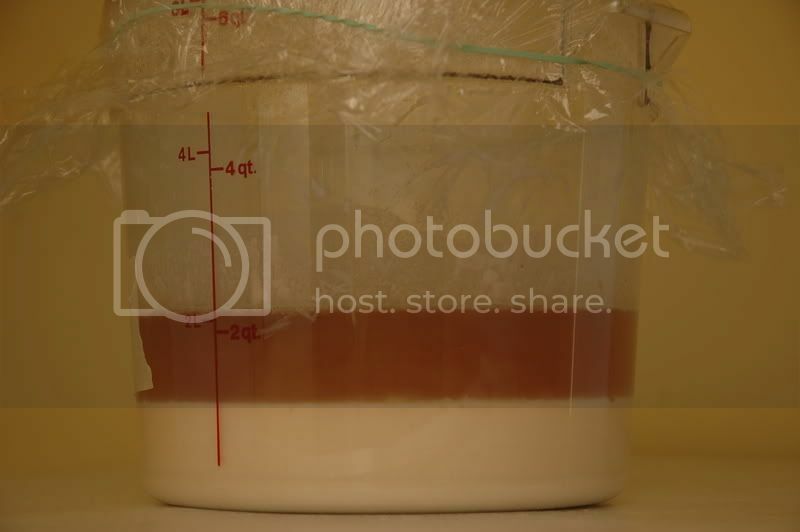 Now my starter will be in the fridge for three weeks as i have to do some traveling for work, No Baking for a while :( i hope it is still ok when I get back and I plan to refresh it and work with it continuting the method in the BBA. I have a BBA style starter like yours. I've used it to make any number of different recipes from various books, regardless of the starter in that particular book, and I'm sure yours would be fine in the Silverton recipes. I've had no problem leaving mine in the refrigerator for long periods of time. I even revived it from a 2 month refrigeration once. For only 3 weeks, it would probably revive with just one refreshment, but I would usually refresh it twice in one day at room temperature, just to make sure it's really going. As far as baker's math, you can get away without much math most of the time by first building a starter that has the same consistency and flours as what is called for in a given recipe. For example, with Glezer's recipes in "Artisan Baking", you can just build a firm starter using some of your BBA style barm, and use it as is in her recipes without doing any math. I think it usually will result in something closer to what was intended by the author if you do it that way, anyway. In BBA, some of the recipes have a "firm starter", so if you see recipes that call for a firm starter in other books, you can get some good clues for how to create something similar by reading some of those examples. 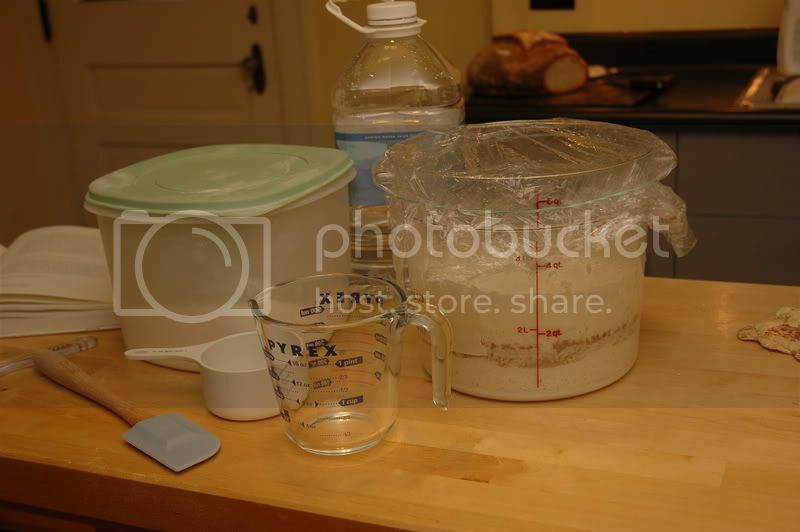 You can build and perpetuate starters - levain or sourdough - in small quantities. Like the OP, I started with giant quantities of starter. 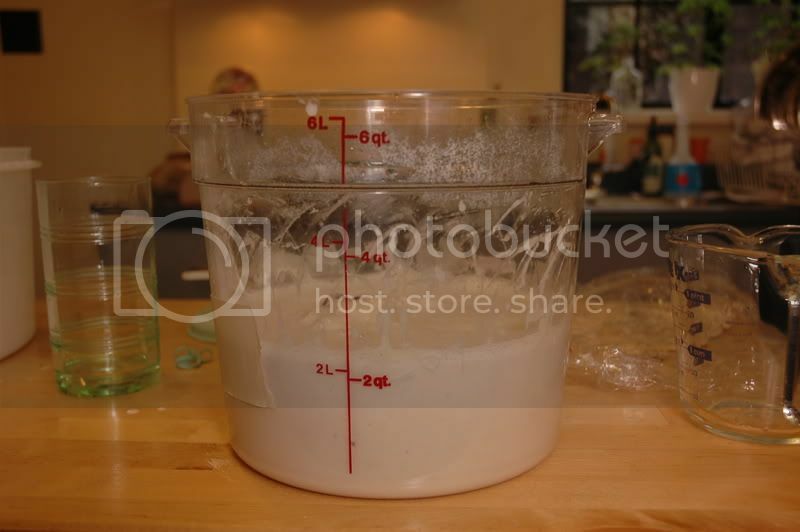 My refreshment would be 8-9oz of existing starter + 4-8oz of flour + 4-8oz of water. Over the last year or so I've learned it is MUCH easier to deal with smaller quantities of starter., flour waste notwithstanding. It seems to be easier to reliably keep it going strong, as well. The formula I've settled on for refreshment is: 1oz of starter + 2oz of flour + 1-2oz of water to make a sticky dough. My 2c. Take it for what it's worth ;) I will say that my sourdough results have been better than ever before. 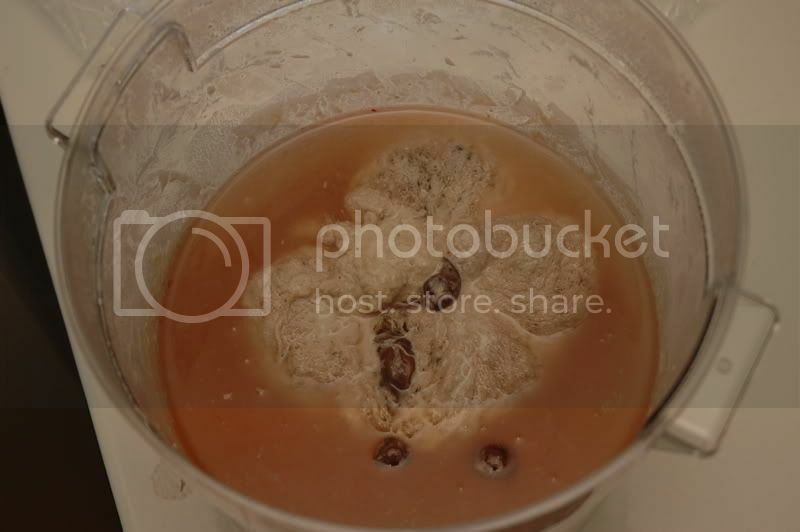 "Second, and this is a big breakthrough I think, you should stir your seed culture starter two or three times a day, for about one minute each time, to aerate it. Yeast loves oxygen and multiplies faster when you stimulate the mixture with air. In addition, the stirring evens out the hydration of the dough and exposes any surface organisms that may have drifted onto the starter to the acidic environment within, and thus deactivates them while the yeast and the good lactobacillus organisms continue to grow. I've lost count of how many people solved their starter problem simply by this aeration technique." Also I want to thank Squid I hope you keep checking back as I will keep posting here over the course of this experiment. You, of all people here even not being an expert I would like to see how your experience with Silverton's book goes because you are the only one here so far besides me who seems to have tried her recipe. Maybe the stirring does help w/contaminants. I had forgotten about that argument for stirring. Sounds like just sticking with it is a good choice, if for no other reason than just to see if the method works when you follow it through to completion. I think Squid's right that it should be fine. If you get a chance, I'd still love to know what happens if you try the method in the sourdough faq, if you have any interest in giving it a try. It would be interesting to see if it would crank right up, like seems to have happened for L_M. Although your culture may have some unwanted leuconostoc or other contamination, there's one symptom that doesn't fit your picture very well. When I had this problem, it would bubble up dramatically in the first 12 hours and was not very pleasant smelling either. If I read your posts right, that did not happen to your culture. I don't think it ever really smelled bad, unless I missed something while reading along. white flour, proof your starter for 12 hours at 85 degrees. Maintenance of temperature is very important. for no less than 12 hours. starters revive MUCH quicker than this. It might be interesting to try this, but no problem if it's not something you have time for or just don't want to mess with. Meanwhile, good luck carrying on with it. Aw, you're welcome. I'll keep checking back for sure. I did SourdoLady's starter as well as Nancy's starter at the same time. Both gave me great looking starters although I have yet to bake with SourdoLady's. It's next. Unlike other starters where you start feeding right away, with Nancy's you don't. It's mostly just wait and see until Day 10 when you start to feed it. It was actually good seeing how the process differed between the 2 starters. I have Nancy's Rosemary Olive bread proofing right now. I actually used an Italian Starter I got from Sourdough International. It's an experiment to see if my oven is broken as the last time I baked bread, it didn't bake underneath b/c the heat wouldn't get to where it should be. KitchenAid had me turn off the breaker for 1/2 hour and then turn the oven on to see if that fixed it. Wish me luck. Well I hope you saw this link http://www.pbs.org/juliachild/default.html that was posted here recently. You will have to exscuse me if it was you who posted it I don't remember who it was but it has a video among many others of Nancy making that exact bread. I agree with the making of multiple starters as I said earlier I want to tey the one from BBA I would like to try the Poilane style Miche as well as others in that book. My only problem with that is I almos burned out my KA Artisinal mixer making a country loaf from Cook's Illustrated's Baking Illustrated book wich by the way is a relly good book for a very wide variety of baking recipes I have trie several of the breads and all of them were very good as wellas the choclate chip cookies. That book is what started me int making bread alot more again I have always been an avid baker but I stopped for a while till I got that book and now most of the people I know say I am trying to get them all fat with all the baking I am doing. Yep, that was me. LOL It was Julia Child's website that started me making artisan bread. I've never really liked regular bread, but this stuff? It's a whole other ball game. I might try the brioch recipe of Nancy's too. I'd like to make the sticky buns and try the Creme Fraiche Custard Brioche one day. Well still quiet still flour on bottom and yellow liquid on the top I'm ging to keep up the stirring today and hope for some action. So just out of curiosity what would be happening if leuconostoc were present. 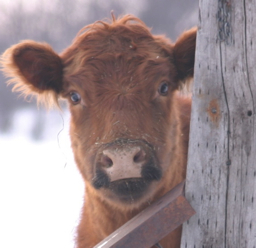 As per the instructions in the book feeding will not start for a few more days it is still just waiting right now. JIP, you have to try that recipe in her book. It's the best bread I've eaten to date. So you made Nancy's Rosemary Olive Oil Bread with a different starter? 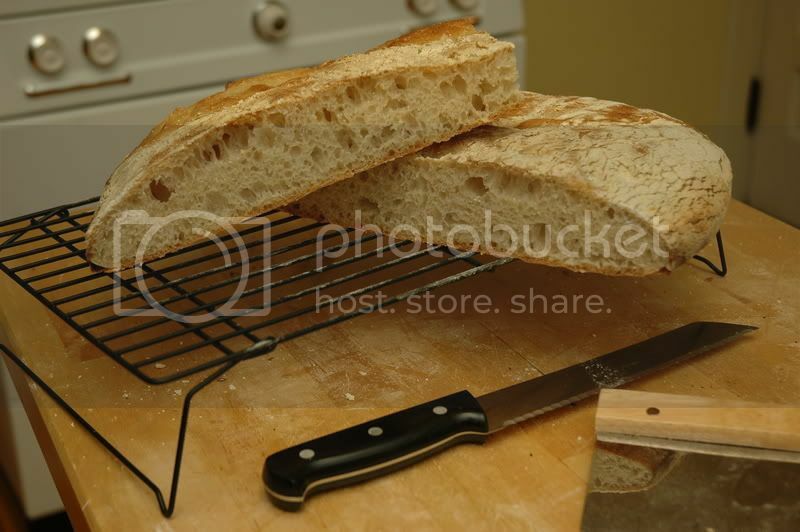 I really want to try that bread, I shoud just try and make it with the starter I have now, right?? BTW, Syliva, I read the front page of your blog and started laughing, I too am now disecting breads at restaurants - poor things! Yes, I used a different starter than Nancy's for that recipe. My other starters are all the same consistency (like thick pancake batter) so it's easy to switch them around. No having to make adjustments. This time around, I started baking after an 8 hour feed (last time I did a 12 hour feed) and the sour was less prominent. At least, I'm assuming that's the case unless the Italian starter is more mild. I'd have to experiment more to know. So this is where it stands now as I said yellow liquid on top and flour on the bottom and a distinct wine like smell this is day 8, 2 more days till the feeding actually starts. I just wonder a little about the color. Did Squid get that dark color, too? I didn't see that dark color in the video posted below of Silverton doing this, and the dark color can be an indication of contamination in other starters. However, maybe it's just the color of the grapes, but Silverton used dark grapes too, and hers just doesn't look dark like that. Maybe it's fine, but it would be nice to know that color is normal for this method. In mine the hooch is grayish, sometimes with a little darkness to it, but not quite like that. Bill, the hooch in mine was dark too. I know what you mean, though. The hooch in my other starters was always a different color than Nancy's. I had just assumed that it was the color of the grapes. I understand what you mean with Nancy's video. It looks lighter, but I wonder if she was stirring her starter instead of letting it sit? I stirred my starter once each day and it didn't look as terrible as when it just sat like JIP's. Yep, that's on target, JIP. Yep, that's on target, JIP. This is the frustrating part of her starter. Doing nothing. But in 2 days you'll be busy feeding it 3 times daily. I just watched her video a second time and one thing I noted when seeing just what you mention is that the container she uses is alot narrower than hers so (and this may be wishful thinking) the grapes fill the top of the container and therefore all of the liquid but I guess we shall soon see. Yeah, at least you only have to wait one more day before you know. Well now it seems like there is a little more action. I went to stir it this morning when I got up and when I took the plastic wrap off the container I saw all these bubbles rising to the top that looked like they were imbedded with flour and the yellowish liquid is alot more coudy so it seems like it is waking up. 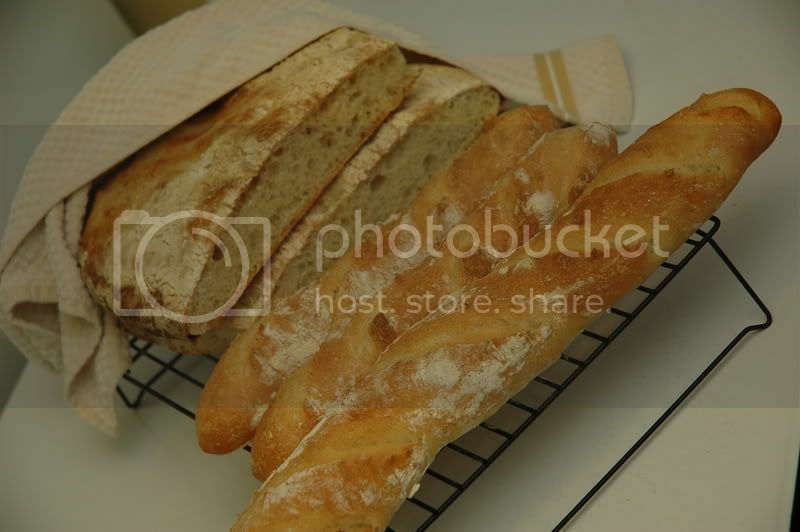 I will be starting my feeding scedule tomorrow just a few mor days till bread!!!! Busy day tomorrow. 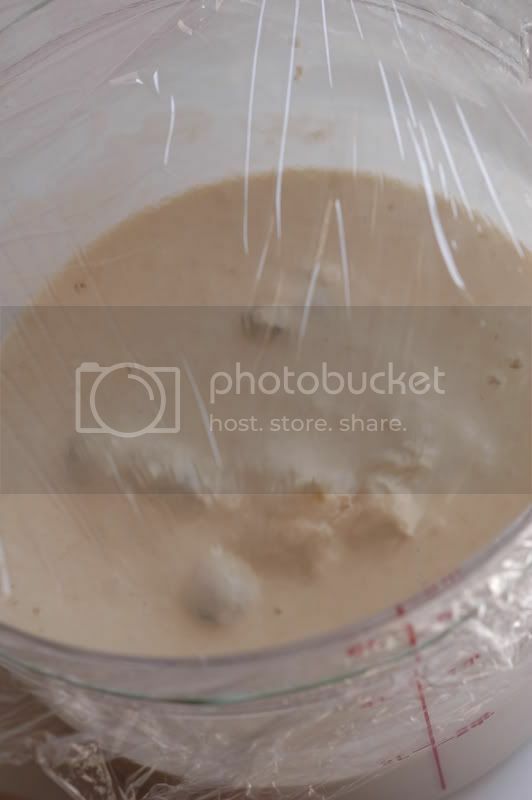 The first feedings of my starter comence a few more days and I can bake. I also plan on making Acme baguettes from ABAA but I let the scrap dough ripen for alot longer than they say to just to see what happens. 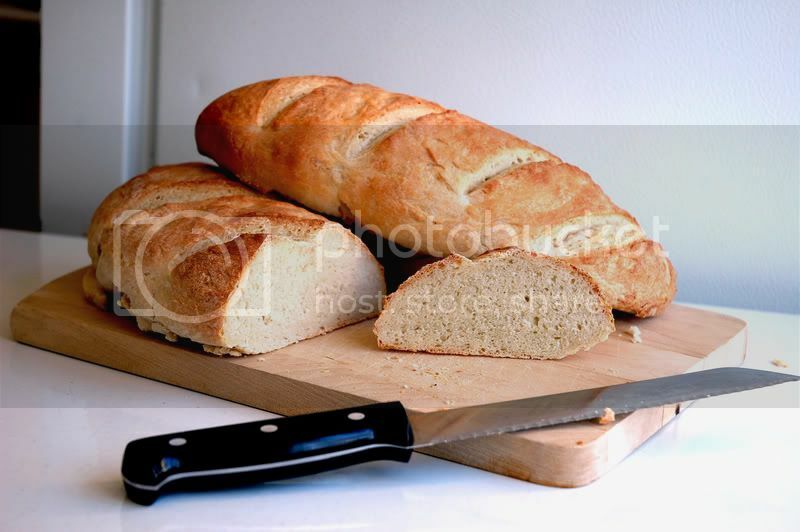 I will also be making a couple of loaves of Cuban bread this is a great very basic bread that makes an ecellent sponge for soaking up the black bean soup that my wife always makes to go along with it. Just wondering about what Cuban bread is. Could you post a recipe or tell me where to look it up. I'm not sure where it came from so I guess it is not a copywrighted recipe from a bok so here goes. It is so simple to make but very good. I haven't looked at this since I have been making more complicated bread so I might have to change some things. Slash tops of loaves in 2-3 places and brush with water and sprinkle with sesame or poppy seeds. Put in cold oven with pan of boiling water in the bottom, bake at 400 for 40-45 minutes or till internal temp.reaches 200-210. One thing I will change today after trying to make this by hand today is that from now on I will be using my mixer for this. It is a heavy dough that I think benefits from alot of kneading. Well as I said a veruy busy day I just came upstairs from taking the last baguettes out of the oven @ 9:30 PM I made them and the cuban bread. I also had my first 3 official feedings of my starter. After 10 days I am now getting a little concerned I still have a winey smell I also have only a few small bubbles suspended within. There is some foam on top but that could just be from stirring. I really hope after all this time my starter did not fail. And wow! I was warned but I cannot believe the flour waste I think I will throw away 3 Lbs. of bread flour tomorrow when I feed it again since she says to discard all but ab. 2 cups before feeding. This better be good after all this work and all this flour waste. So Squid what did yours look like at this point. looks good in the photos. It looks good in the photos. It doesn't sound that unreasonable to have a winey smell. You have grapes, alcohol, and yeast in there, after all. It has been sitting without feeding for quite a while, so you may not have that much activity until you feed it. I think after you feed it a couple of times, it will be a better time to judge it against a typical starter smell and activity. Thanks for the Cuban bread lesson, by the way. Like Bill says, it looks good to me. You've got a starter. Yours looks a bit thinner than mine did, which is probably why it doesn't look as active. Re: the waste. I won't argue that point. LOL I know Nancy thinks that using more flour makes it easier to make the culture survive. At least it's only 5 days of feeding it that way. I now have her starter in a 1 Quart wide mouth mason jar and feed it like my other starters. Little waste. You could save some of the starter and use it for pancakes and such so it doesn't have to go to waste. Or you could use less starter and feed it less flour and water (scale it down) if you feel like changing from Nancy's instructions. 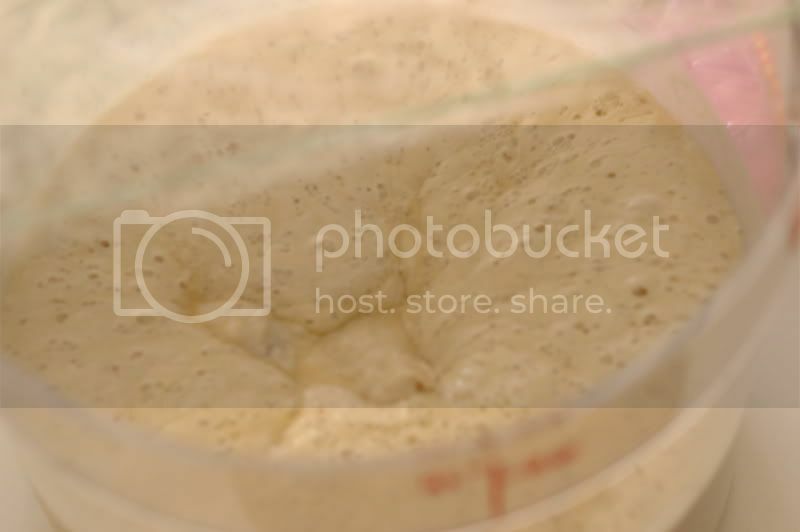 The most recent photos I posted of my starter are immediately after it's last feeding the third of today. I am hoping some action happens overnight I have always read a starter is most active ab. 12 hrs. after a feeding. Ans as far as the Cuban bread for such a simple bread I love it, when it is warm it tastes like it has butter on it without even using any. I ate it tonight with som nice black bean soup my wife made. Well more of the same today three feedings and wait. I am really not liking disposing of all this flour and actually neither is my wife I think I am going to try and use some of it tomorrow instead of throwing it away. In her book nancy silverton has a recipe for a rustic bread this is what she calls it it pretty much is a Cibatta it is one of the few 1-day breads in the book. I would hate to waste 2-3 days making bread with this starter and have it fail. I am planning on cutting this in half as I do not think 8 cups of flour will fit in my mixer bowl. Does anyone have any suggestions or tips on dividing a recipe like this? I am using measuring cups as I cannot afford a scale right now so I know I will not be able to be as accurate as I should. I don't know if this appeals to you, but it's an easy way to use old starter, especially if you're not sure how active it is. You can take some of the starter, mix with some applesauce, milk, a little butter or olive oil, an egg or two, cinnamon, some sugar, maybe a mashed up banana, blueberries, you name it, to get the right pancake consistency and good tasting stuff in there. Then just toss in 1/4 tsp salt and 1/8 tsp baking soda per cup of starter or so. The sourdough flavor is great along w/the fruit, salt, and maple syrup on top. Chocolate chips good to toss into them while they're on the griddle. Strawberries can be good on top after they're done. This idea really caught my eye as you can imagine how much old starter I have...so instead of fruit I mixed in some sauted onions and mushrooms, pesto, ricotta cheese, grated cheese and spices - voila - fantastic! When I make up a casserole of any kind I also add a 'glob' of old starter in for flavour. JIP, I really keep very little starter now that it is strong and active. I save a tablespoon or so from my expanded starter, mix in about a Tablespoon of water, then add two Tablespoons of flour. Mix it all up well, cover and leave it several hours at room temp until it is swollen and bubbly-looking. Then it goes in the fridge. Generally I make a couple of small loaves 2 or 3 times a week, and do not need to refresh my starter between batches. Take this comment with a grain of salt, please, as you might need to make much more bread than I do and that would make a huge difference. This is just what works for me. On measuring, Silverton says on page 19 of Breads from LBB that she scoops and levels with a knife, so that method will certainly work with her recipes. Most recipes are far too large for me, so I divide a lot and have had no trouble. Good luck with the Rustic Bread. 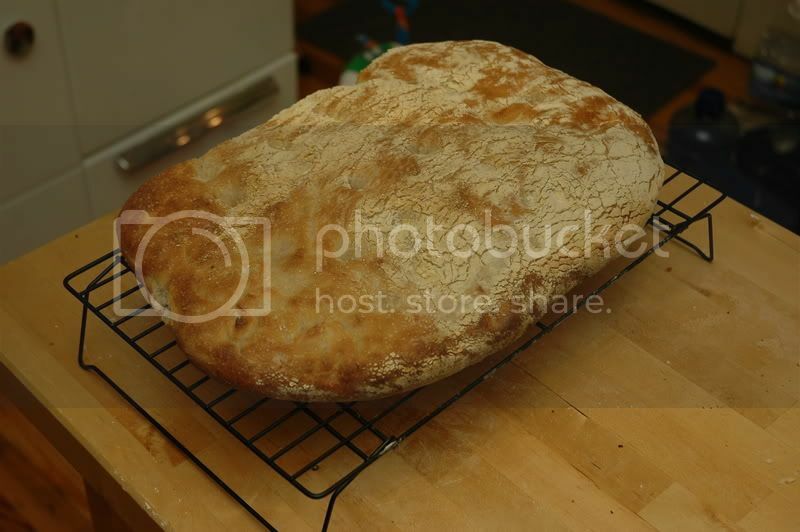 Well I did it the rustic bread (Cibatta) is in the oven it smells great it is giant I halved the recipe and it still is almost filling the oven. I think I slapped on the counter a little when I flipped it so it might have deflated some but it seems like it still has some oven spring. I will be back later with pics and a report. Wow another busy baking day but I finally got to use my starter. After all this time, waste and work I made my first and the simplest bread in the book. I said it was a cibatta but it was kind of like a cross between a cibatta and a focaccia but it tasted great I think I may have de-gassed it a little when I flipped it as was suggested in the recipe I will have to work on my technique. so here are the pics. Now that I know or I think my starter works I am going to tackle the 2 day bread. Glad to hear the starter is working out. I'm a big fan of sourdough focaccia. The sour flavor goes great with two different versions I like to make. One is basically "BBA Poolish Focaccia" using starter in place of poolish, and adding 1 box of raisins and 3/4 tsp of salt sprinkled on top. It's a very nice breakfast bread. The other is same thing, but saute onions and garlic in olive oil, also andouille or similar sausage, and push these into the dough after it's in the pan. Late in the bake, spread some grated asiago cheese on top. The sourdough flavor is just really good with those ingredients. Congrats, JIP. You've got a viable starter. How did it taste? Excellent actually I have never had a crumb quite like the one in this bread. It was very moist and shiny and it had a very nice flavor. I tasted the dough before I made the bread and it had a very sour flavor. This being my first experience with sourdough I have never had such taste in my bread. And just for your info the baguettes are Acme from ABAA. So my next question is when I decide I do not want to bake with ths for a while I can just put some in the fridge and let it go dormant for a while, correct?. How often, if I am not baking for a while because my wife says I am getting out of hand with all the bread I am baking, do I need to refresh and feed my starter? or does it only need to be fed if I plan on baking. congraulations on your bread--it looks really good! Since your starter is still very new, I wouldn't leave it dormant for long periods of time. In order to keep it strong and viable you should be nice to it and feed it once a week for awhile. Established starters can and do live dormant for a very long time without feeding but every starter is different and you don't know just how long it can survive. You don't need to keep a large quantity in the fridge, though. A Tbsp. 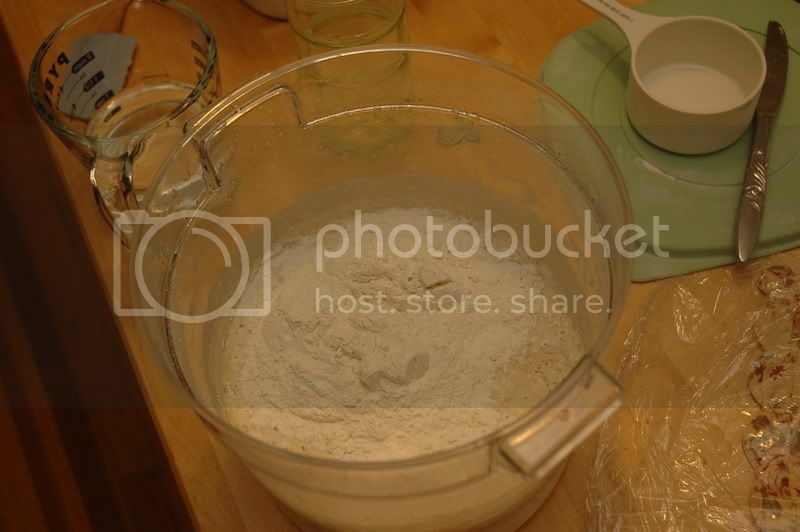 of starter fed with 1/4 cup of flour and however much water you like for the consistency you prefer is plenty to keep. The thicker you make your mix the longer it can go between feedings. I think it's dead, honestly, I think it never lived. Any of the leavening in my first loaves must have been done by the small amount of yeast that was in the recipe. I started the country white today, I let ti rise for more than the alloted time of 4 hrs. and no air the dough just seemed dead, just a blob no life or anything. Well I still followed what the book says and formed the loaves and put them in the fridge to ferment overnight but I am not expecting much. I really think for now this quest is over. I will try another soon but for now I will just do other non sourdough breads what a waste! When you feed your starter does it bubble up and look alive? If it does, it is not dead. Sometimes sourdoughs will just sit there and look dead for hours, then all of a sudden it will start to grow. When you take it out of the fridge tomorrow it will be very cold so don't expect it to rise much for several hours. Be patient and just put it in a warm place and give it some time. I've had refrigerated dough take all day to rise before. Good luck--and have patience! Well I guess I can hope but I really need to get a container that I can mark where my bread started so I can see how far it has risen. When I put this dough up for the first rise I cannot remember if it rose and got bigger or just spread out. Another reason I think it never lived is that I really never got the activity I expected it was always very thick almost like an extremly runny dough and just got a foam on top as you can see from my pictures but I really don't think I ever got lots of bigger bubbles suspended just tiny ones. You don't necessarily need to have big bubbles suspended throughout the starter. As long as you see small bubbles suspended throughout and larger bubbles on top, it will be fine. Are your loaves free-form? If they are and they are spreading, take them out of the fridge and do a couple of dough folds spaced about 45 minutes apart. That will firm the dough up a lot. Then reshape and put them back in the fridge until morning. If you really are going to give up on this starter and want to try again, try my pineapple (or orange) juice starter recipe to see if you get better results. I'm sorry you are having bad luck. Sourdough is so much fun once you get it rolling. I just read a sourdough FAQ I found a link to here and I think I may have overproofed my loaf I hope that is what i did and there is still hope. Iimagine this has been answered here before but I will ask it again I assume a starter is a starter so I this fails and I still want to make some of the bread in Silverton's book I can use another starter?. You can use any white flour starter in any recipe that calls for a white flour starter. I've made recipes from any number of books, including Silverton's with just my one trusty starter (not a Silverton starter). You just have to make adjustments to the dough or build a starter up with different hydration if your starter has a different amount of water in it than what the recipe calls for. You can also convert a white flour starter to a rye or whole wheat starter if you need one for a rye or whole wheat recipe. Your starter may need to be fed repeatedly for a while until it comes to life, if it has somehow become dormant. However, it should be fine. The one thing you always hear is that they come around with patience. Yours looked pretty active in the pictures, and they aren't that easy to kill off for good. If not, start over w/SourdoLady's recipe. You can also use BBA, if you have that book, but just use pineapple juice instead of water on the first two days. Or, use Maggie Glezer's recipe, if you have that book. However, the one you have probably is OK with a little patience. Once you get going, it's just as easy as yeasted bread, and the expanded range of flavors is worth getting over this first hump. Okay, you said that your dough didn't rise at all so how could it be overproofed? Or did you mean overdeveloped--as in too much mixing in the mixer? Are you using a mixer to make your dough? Sourdough is easily overdeveloped when using a mixer or bread machine. When this happens your dough will appear shiney and very slack, will not hold its shape. I usually only mix my dough briefly and then finish developing the dough with stretch and folds. Yes, a starter is a starter and any of them can be used with any recipes from other sources. The only thing that might be a factor is that some cookbook authors use a wetter starter and some use a firm starter so you may have to adjust the flour or liquid accordingly. Well as far as thinking it was overproofed I guess I need as I said some way of measuring if my bread has risen properly. When I originally made my dough I left it for much longer than was called for in the recipe this was necesarry jsut because of time factors on my part but when I returned it did not really seem doubled but I guess it could have been but it just looked spread out instead of puffed up it also did not look "alive" to use a Nancy Silverton term it is what she said in the book but I have enough experience with dough to know what that means and my dough just looked like Blah and it didn't feel all that alive either no air bubbles no air inside it was almost liquid. 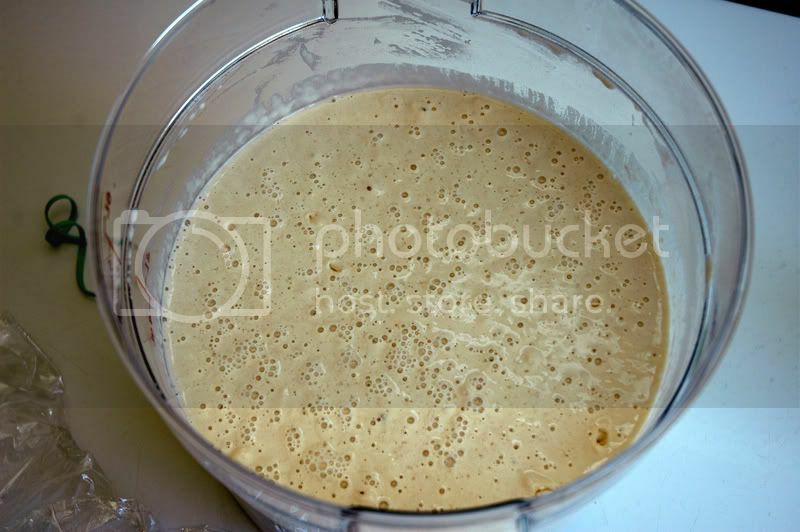 Why I said it might have been over-proofed is that I read in a FAQ I found somwhere on this site that a dough might spread out instead of rise if it is over-proofed I can't remember the exact words that were used but it really described my dough. Also as far as BBA and Gleezer's books I have them all Pittsburgh has a great library system that whenever I see a book I want to check out I just go online I can search the entire system in Pgh and as long as someone has it on the shelf I will have it at my local library within a couple of days now the only problem is that all these books are so good I never want to return them. Oh yeah I did all my mixing by hand I have KA Artisinal but I have been getting into mixing by hand lately and I originally thought this dough would not have fit in my mixing bowl but looking back I guess it would have but Man! talk about a sticky dough. So, what ended up happening to your bread, JIP? I find it hard to believe with all those bubbles, that your starter wasn't active. Well put it this way today I went to Whole Foods and bought some pineapple juice. Oh no! It baked into a brick? Well I actually have not tasted it yet because it never rose at all in my lined colander it just laid there like a hockey puck. I wanted to throw it away in disgust but my wife insisted on baking it so she did when I went to work she seems to like it and so does my baby but I just can't bear to look at it let alone eat it so I really can't tell you how it came out. So now that that's over I want to get this straight I started Sourdolady's starter today and I have jus one question so far should it look like a paste?. I used 2T. of pineapple juice 1T. of whole wheat flour 1T. of rye flour and it came out like a psete I just want to know if this is right. I don't know what to say, JIP. Looking at those bubbles in that pic, it looked active to me, just like mine. Could you have done something wrong? Did you throw out her starter? It might have been interesting to keep a tiny bit and feed it the same amounts as SourdoLady's starter so there wouldn't be a lot of waste. No matter, you've started a new one. I hope you're able to get it going. Yes, it will look pasty. Good luck with the new start! I did keep it I have it in a mason jar in the fridge I'm not sure how long it will last but I intend on doing just that. O.K. so I think I really have a problem I strted Sourdolady's starter it has been going for 3 days and nothing. I used pure unsweetened pineapple juice rye flour and whole wheat flour and followed the directions to he letter and I have no bubbles. The only thing I can think of is a temperature issue it has, up until the last few days been cold here and even now it is not hot but I just can't figure it out. Three days is not long enough to be concerned, especially if your kitchen is cool. In fact, most of the time it takes 5 days to see much activity at all. Be patient and, if you can, try to find a warmer place to sit it while you are waiting. Give it a vigorous stir several times a day. It will come around! I figured as much I just see the pictures with the recipe and they show lots of bubbles at 3 days. So if I have very little activity should I still proceed to day 4 feeding schedule? or should I keep w/juice. I plan on moving to bread or AP flour does it matter wich I use I have plenty of both. Also is the measurement of 1/4 cup to save a liquid measure. Yeah, keep with the juice for another day or two. You could use either flour. The starter feeds on the starches in the flour and it could care less about the gluten content, so AP flour is fine. 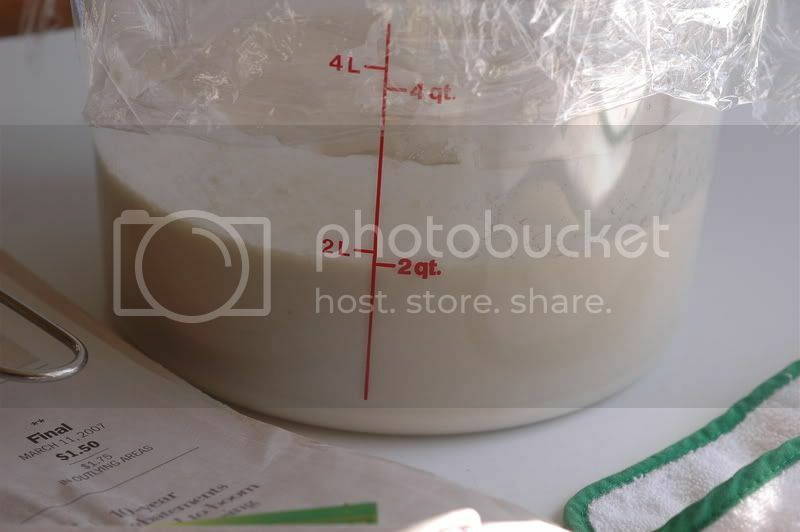 The measurement to save can be liquid or dry measuring cup or even 4 Tbsp. They all come out about the same. It doesn't have to be precise. Did you come up with a warmer place for it to live? Not yet but I'm thinking my oven has a compartment next to the actual oven that stays pertty warm and not hot when the oven is not in use (it's a very old stove) I guess just for starting it could live there for a while.